A longer life – as healthy as possible, mentally in shape and physically in top condition. Most people probably have this desire. The market reacts with offers dealing with digital self-monitoring, and research is also conducted to deal with this topic. 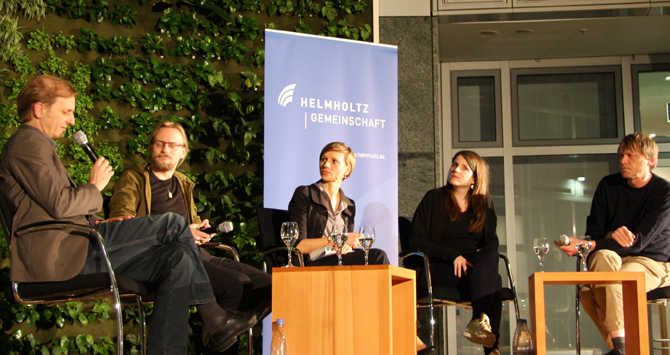 In Berlin scientists and philosophers discussed this in the event series "Fokus@Helmholtz". Who doesn’t want to feel a bit more in shape, more beautiful and healthier – or get ahead in their profession? The market for self-optimization is booming: Ever more consultants, nutrition concepts, apps, courses, pills and perhaps even genetic engineering all promise an improved and longer life. But do we really feel healthier after all is said and done? What direction does the optimization take? And what does it have to do with a better life? Or is constant optimization just a social ritual that many individuals take part in, in order to avoid looking like a loser? In the podium discussion “Higher, faster, further! – The Quest for a Perfect Existence” it quickly became evident that there are very controversial points of view regarding this modern phenomenon. Arnold Sauter from the Office of Technology Assessment at the German Bundestag has observed several driving forces behind the rapidly growing self-optimization trend of recent years. In his short introductory speech, he indicated on the one hand the disappearance of traditional structures and religious commitments. This requires a lower degree of integration for the individual into society and also a decrease in spiritual orientation. This goes hand in hand with the increasing cult concerning one’s own physicality. Moreover, the growing compulsion to promote oneself in today’s economy is complemented by, thanks to scientific findings, the aspiration to also be able to continuously improve oneself. Bastian Greshake openly admits that he feels healthier and more satisfied when he takes advantage of the opportunities offered by modern technology regarding self-optimization. And the doctoral candidate in Applied Bio-Informatics at the Goethe University Frankfurt does just that – extensively. Not only does he meticulously analyse his nutrition, his sleep and his sports activities; he has also set up a databank for genetic data that is open to everyone. Anyone who has taken a genetic test can upload his data there and make it available to research scientists. And it is not only large firms that receive a benefit from this. He agrees however with Arnold Sauter that many expectations regarding such genetic tests have been set too high: That is to say, to date, far too little medically relevant information has been gained from this data. Knowledge regarding genetic links however continues to grow. Targeted manipulation of genes using new methods is also becoming possible – something that earlier scientists hardly dared to imagine. “By making use of interventions into the human germ line, hereditary diseases, for example, would be treatable,” says Ralf Kühn from the Max Delbrück Center for Molecular Medicine in the Helmholtz Association (MDC). One could thereby prevent the emergence of diseases such as sickle-cell anaemia. Indeed, in Germany such techniques are currently forbidden, but not in other countries. We are therefore forced to grapple, with increasing intensity, with difficult ethical and legal issues, the podium group concurs. “If it is possible to do something, it will be done,” Ariadne von Schirach states. The philosopher and author has expressed an ardent plea with her book “Du sollst nicht funktionieren” against the growing trend towards self-optimization and self-marketing. She considers it to be dangerous when the economization of the world leads to our own self-worth being equated with market value. Perfection of the external packaging can then only be gained at the expense of the inner self. Von Schirach observes here an objectionable and unbalanced characteristic of contemporary culture. The individual is therefore always being forced to choose wisely to what extent he or she is prepared to follow social trends or his or her own preferences. The paradox inherent in self-optimization is that, according to Schirach, it follows on the one hand prescribed rules from the outside, while at the same time it is egocentric. Schirach proposes, as a counter prescription, that individuals in this day and age should gather the courage to become self-oblivious. Despite all the differences, the participants agreed on one thing: The increase in mental performance, the so-called neuro-enhancement, has obviously been overvalued by the media. While top-class athletes are able to coax, through respective performance-enhancing substances, a few more percentage points here and there, the brain is not so easy to optimize. Heretofore, there is no known substance with which one could appreciably dope his or her brain. Apparently, the brain in a healthy individual already functions so well that foreign agents are hardly able to improve it. And who has ever claimed that higher intelligence automatically makes us content?